It’s been a busy weekend with the 6th NCT birthday party at a farm in apocalyptic flood rains, a night out at the Southbank including the worst burrito ever from a street food van, making us wonder if they picked the ingredients off the street (and this van was parked outside the restaurant, so God knows what the food was like inside) and then a school friend’s sixth birthday party, fortunately nearby and lovely. I honestly don’t know how children’s entertainers do what they do without needing to sit in a dark room for a day after. He was, actually, more fun than the adult show we saw on Saturday. C’est la vie. So when you start the week feeling broken, cooking can be either therapy or chore. I know it’s Monday, and the advice is always that fish is not to be trusted, like a shadowy figure appearing from a dark soho alley after a lost weekend, but I do have some nice sea bass that has been well looked after. Monday, for me is normally a low calorie day, I usually have a light supper as the only food I eat. I’m trying to keep my body from turning into a temple of doom. So here we are with something so simple it almost hurts. But the beauty of this is it’s so simple it’s amazing. Four main ingredients that take minutes to put together, but the result is light, delicious and healthy and tastes like a rather special treat. 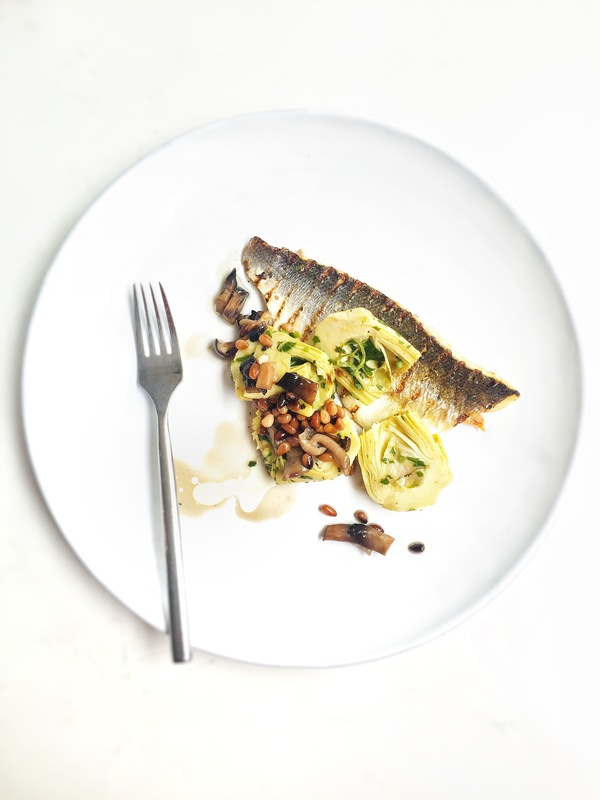 Sea bass, mushroom, artichoke (my favourite brand is El Navarrico) and pine nuts. The artichoke, slightly acidic acts like lemon would do with the fish. Heat a griddle pan until you can melt rocks on it. Rub some olive oil on the fish skin and season well. Place the fish skin side down on the pan and cook for about 2-3 minutes, until charred with the lines of the griddle and the fish lifts away without tearing. Turn the fish over and add the mushrooms, some more oil, the garlic and pine nuts. Cook for a minute then transfer to a plate. Add the artichoke, mix in a few herbs and serve with black pepper. Very nice idea indeed….my godson is a children’s entertainer…when he’s not playing in a band! It’s beyond my wildest imagination but he says that he loves it and apparently they love him.